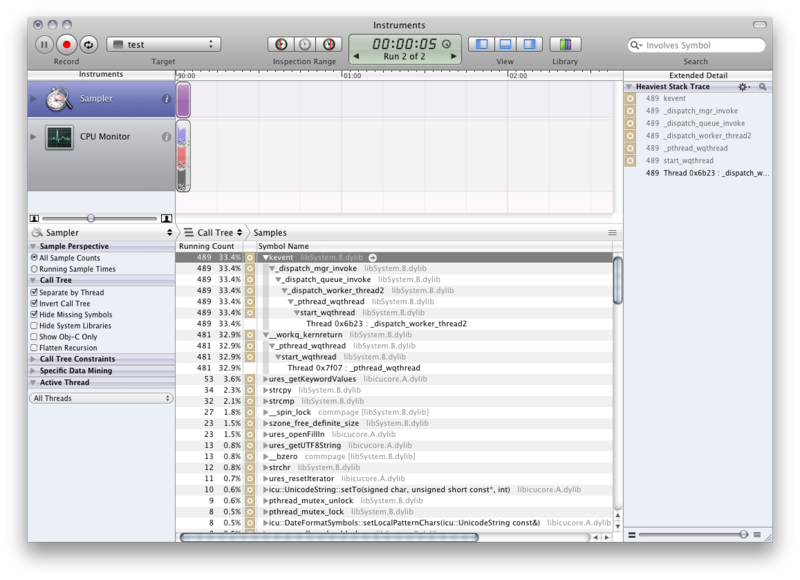 QCachingLocale speeds up Qt’s slow QSystemLocale::query() calls by caching the answers. This seems to be particularly necessary on Mac OS X 10.6. The other day I was working on my master thesis, on the parser that is going to parse Episodes log files. I had finished a rough version that parses all fields on an Episodes log line. Unfortunately, performance turned out to be extremely poor: 4.8 seconds for parsing 1000 lines. [18:08] WimLeers: Xenakios: what do you mean? [18:09] w00t_: 46 ms were necessary for parsing the date 1000 times. [18:09] WimLeers: Xenakios: I'm parsing a log file. I have no choice. [18:09] WimLeers: 4779 ms were necessary for parsing the date 1000 times. [18:10] WimLeers: Quite a difference. [18:10] w00t_: what Qt version are you running this on? in the actual parser, where I do use the result. [18:17] cbreak: w00t_: 5016 ms were necessary for parsing the date 1000 times. [18:17] w00t_: what the hell? [18:18] WimLeers: cbreak: ok Mac-specific issue then I guess! Also 10.6.5? Qt 4.7.1? Release is ± the same probably. This clearly portrayed the problem: calls to QSystemLocale::query are taking enormous amounts of time, and it seems this really is just a bug in OS X: system libs are being excessively active for such a simple function call. A little while later, that same user cbreak posted a rough version of QCachingLocale that partially worked. 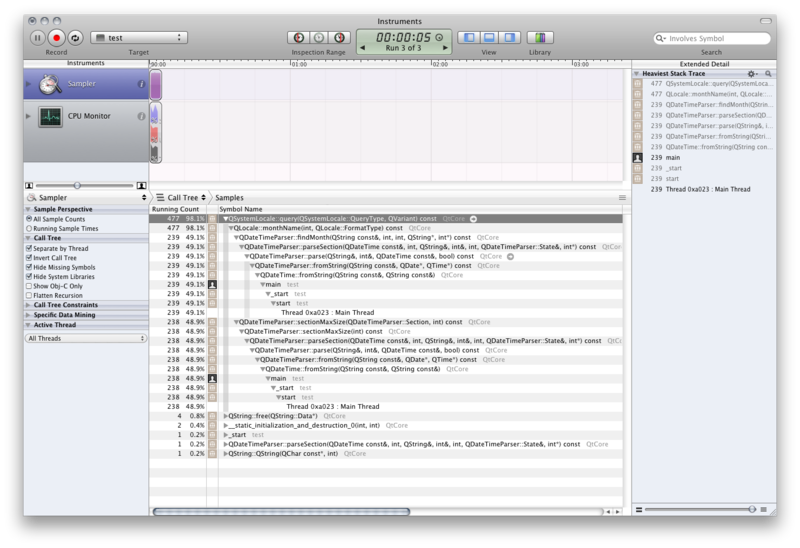 I then worked on it to make sure it supports caching all query types, and ensured thread-safety. It’s licensed under the Unlicense. I worked on it, but couldn’t have come up with it without cbreak. Thanks again, cbreak! 4839 ms were necessary for parsing the date 1000 times. 23 ms were necessary for parsing the date 1000 times. That’s pretty significant. A 210 speed-up factor! So, if you’re using Qt and QSystemLocale::query() calls are making your app much slower than you would expect it to be, give QCachingLocale a try. Integration is trivial. Create a QCachingLocale instance as soon as possible, preferably in the main() function. This will automatically install this object as the system locale and remove any earlier installed system locales. Apparently there was still a problem with thread-safety. That’s fixed now, in commit e6f51533bc15b12a2270a3ba0be87fce79644fb4. Reported to the Qt bug tracker: [#QTBUG-17271] QSystemLocale::query() performance issues on OS X (±100 times slower than on Windows). (I’m w00t from that conversation - nice to see you made a writeup on this). Can I also ask whether you reported it on Qt’s tracker? The likelyhood of it getting fixed isn’t so great if it isn’t officially known.